The three methods I chose was, a mind map, ABC-method and the morphological method – all written in English, as this is not a hand-in assignment. 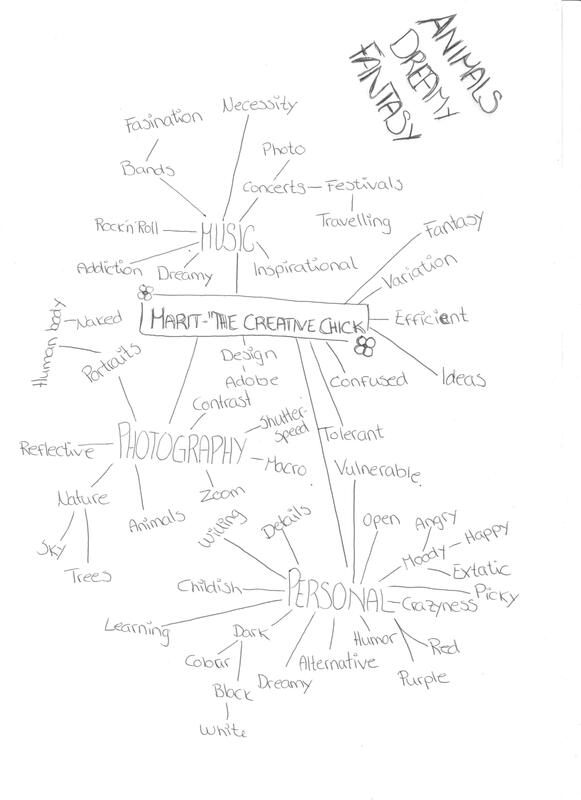 I picked the subject “Marit – The Creative Chick”. Mind map – probably one of the most used brainstorming methods out there. You place your subject, theme, or key word in the middle of a piece of paper. From there, you map out thoughts, symbols, words or images that you associate and connect with the theme. One word connects to the next one, and in the end, you’re sitting there with a full map of words. It’s useful for emptying your head to make space for more ideas, and for associating new ideas and words with the theme. Three words picked from my mind map: Animals, dreamy and fantasy. ABC-Method – a more forceful method indeed. You write down the full alphabet, and you have to come up with at least one word that is associated with the subject decided in advance. It’s more forceful, because it obviously demands that you write down words of a specific letter, while still keeping it relevant to the subject. Please note that I’ve used the full Norwegian alphabet. 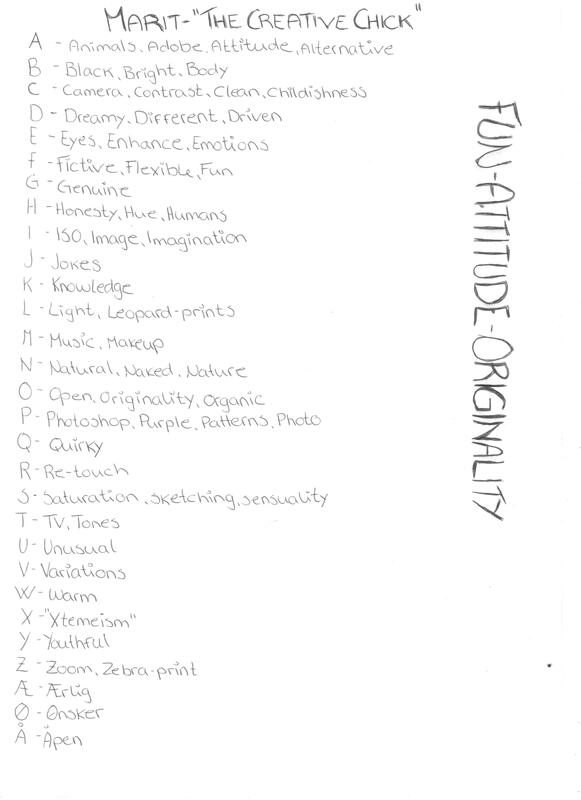 Three words picked from the ABC-method: Fun, Attitude and originality. Morphological method – WOW. This was brilliant, although, I’m not sure I’ve done it a 100% correctly. I have never heard of this method before, so it was challenging, but fun altogether. In description, it says that you’re supposed to write down in rows a bunch of function concepts, qualities and locations/places (such as on the bus, in the forest etc.). I know – I didn’t get it either in the beginning, and as mentioned, don’t know if it’s fully correct. After writing down the things I explained above, you put numbers behind the words. As you can see from my attempt, I chose to divide them in three rows, and I numbered each row from 1 – 7. I tried not to memorize where I’ve written what, to make it as random as possible, and that’s why the rows are not placed next to each other. For each row, I chose a main sentence start. (“I’m creative when..”, This makes me creative…”, Where do I achieve creativity…”)From there, I again wrote down the numbers on a separate piece of paper, cut them out, folded them, and picked three numbers at random three times. I decided in advance how many attempts I was going to use, to get a sentence describing me as a creative performer. 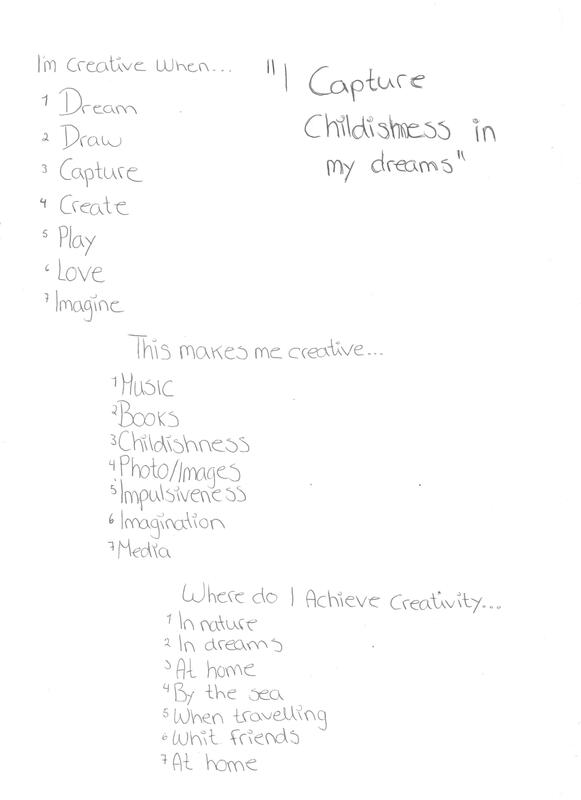 The sentence used from the morphological method: “I capture childishness in my dreams”. Although I’ve spent quite some time on my brainstorming, I’m more than pleased with the result, especially in regards to the next task where we’ve had to use the ideas from the brainstorming for several illustrations. All in all, I realize that I’ve probably used a lot of the same words in the three separate methods. However, I came to the conclusion that it’s a good thing. It’s the same theme for all three methods, and it’s impossible to describe the theme, (moi, as a creative performer), in too many variations. Check out my illustrations in the next journal entry.